Search. Search for any term or descriptive word. Send via Email. Are you an instructor? Email terms to your students for study. 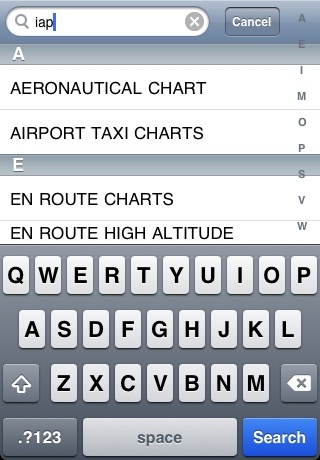 PilotPCG is a version of the FAA Pilot / Controller Glossary (P/CG) for your iPhone or iPod Touch. You might think you know all the terms prescribed by the FAA, but do you really? PilotPCG is a great tool for students and professionals alike. It’s the perfect companion to our other Pilot-products including PilotFAR, PilotAIM, and PilotPrep! 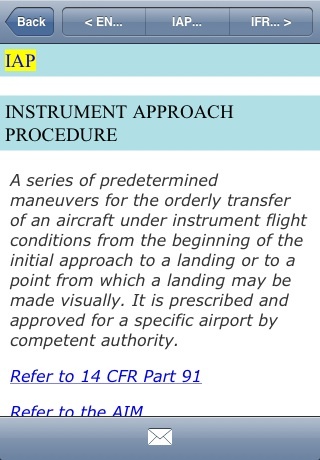 Over 1300 Terms Includes the complete set of FAA Pilot / Controller Glossary terms and definitions. Over 1300 terms! 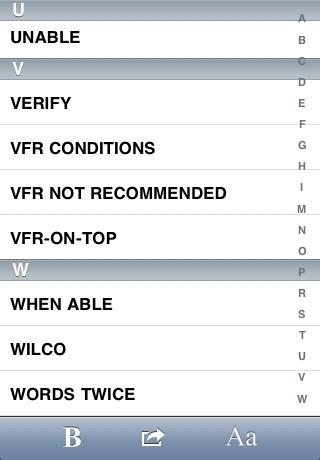 FAA Bold Terms Filter and list only the FAA “bold terms”. 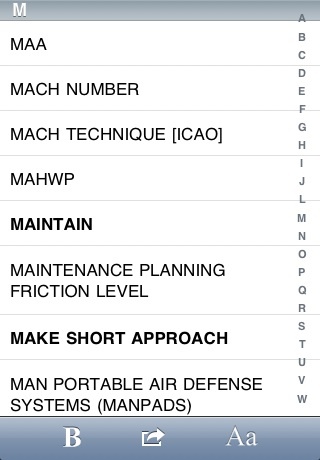 Every pilot should know these - do you? Full Text Search Search the entire glossary for words or phrases. Hyperlinked Content When one AIM topic or regulation references another, just tap the link. 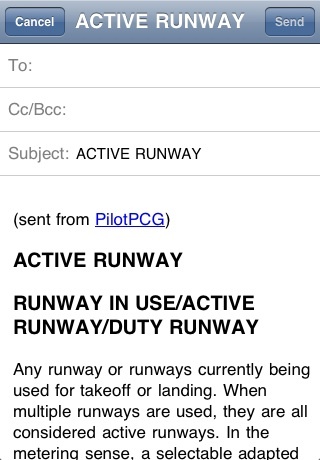 Email Others Are you a CFI? When a student needs to brush up on a term, send it to them - instantly. Integrated Many terms include hyperlinks into PilotFAR and PilotAIM, available separately. Offline Content No Internet connection required to access any of the included content. Many of these features are unique to PilotFAR. Don't be duped by knockoffs - only PilotFAR delivers all the content and features you're looking for.